So did you know that Grover Cleveland was born 174 years ago today? And did you know that his name is associated with a long-standing debate over the name of the Baby Ruth bar? Some people say that this popular candy bar was named after Cleveland's infant daughter Ruth, who was endearingly referred to as "Baby Ruth." Others claim that it was named after the great baseball player Babe Ruth, who hit the peak of his fame shortly after the candy bar was introduced in 1920. Back in 1916, the Curtiss Candy Company was founded in Chicago. The company's first candy bar was called the "Kandy Kake". The product was not overwhelmingly successful, so Curtiss went about refashioning it. And, in 1920, the "Baby Ruth" candy bar was introduced to candy-craving consumers. That would be a pretty simple story, if it ended there. But, of course, it didn't. Adults and kids back then, just like today, were confused by the name and thought it was a candy bar related to Babe Ruth. After all, even in 1921, Babe already had gained a lot of fame in the baseball world. He had hit 54 home runs in 1920 and 59 during the 1921 season. These were incredible records at the time and he was in newspapers all over the country. So, for many, Baby Ruth was Babe Ruth's candy, whether truth or not. Kids around the country purportedly sent the Babe their Baby Ruth candy bar wrappers in hopes of getting his signature. Despite widespread popular opinion that the candy bar was named after the Babe, the Curtiss Candy Company never swayed from its position that it was named in honor of Cleveland's daughter Ruth. But...as many commentators have observed, Ruth died of diptheria in 1904, seventeen years "before Curtiss combined nougat, chocolate, caramel and peanuts into its chewy Baby Ruth." Moreover, Grover Cleveland left office in 1897, and, by the time the Baby Ruth bar hit the market in 1920, William McKinley, Theodore Roosevelt, and William Howard Taft had all served as president, and Woodrow Wilson was just finishing his second term. So why would the Curtiss Company name its candy bar after a long-deceased daughter of a former president? Well, many people believed that the company conveniently concocted the story to avoid having to pay royalties to Babe Ruth, which, if true, would have been very unfair and illegal. Whatever the case may be, the story doesn't end there. In 1926, Babe agreed to lend his name to a new candy bar called "Ruth's Home Run Candy Bar" that was manufactured by the fledgling George H. Ruth Candy Company. In response, the Curtiss Company filed a lawsuit to prevent the rival candy bar from being made, claiming that it infringed on their trademark established in 1919. In 1931, the Court of Customs and Patent Appeals ruled in favor of the Curtiss Company and George Ruth's Home Run Bar was forced off the market. To support its ruling, the court explained that it was evident that George Ruth was trying to capitalize on his own nickname at a time when sales of Baby Ruths were reportedly as high as $1 million a month. Regardless of the legal outcome of the case, the debate over the name of the Baby Ruth candy bar continues to this day! And so NOW you know how Grover Cleveland's name became associated with the debate over the name of the Baby Ruth candy bar! 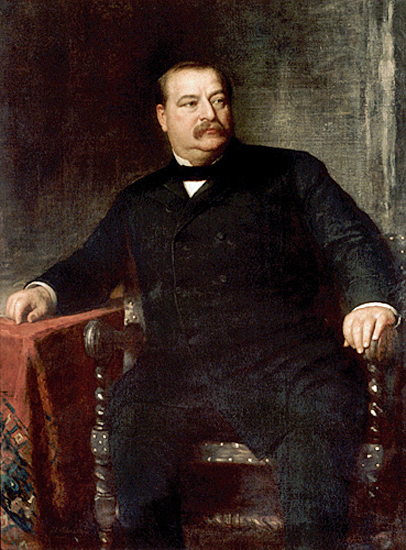 FAST FACT: Did you know that Grover Cleveland is the only president to serve two non-consecutive terms. His first term was 1885-1889 and his second term was 1893-1897 so he was the 22nd and 24th president of the United States. This explains why President Obama is the 44th American president even though there have only been 43 different presidents to date!